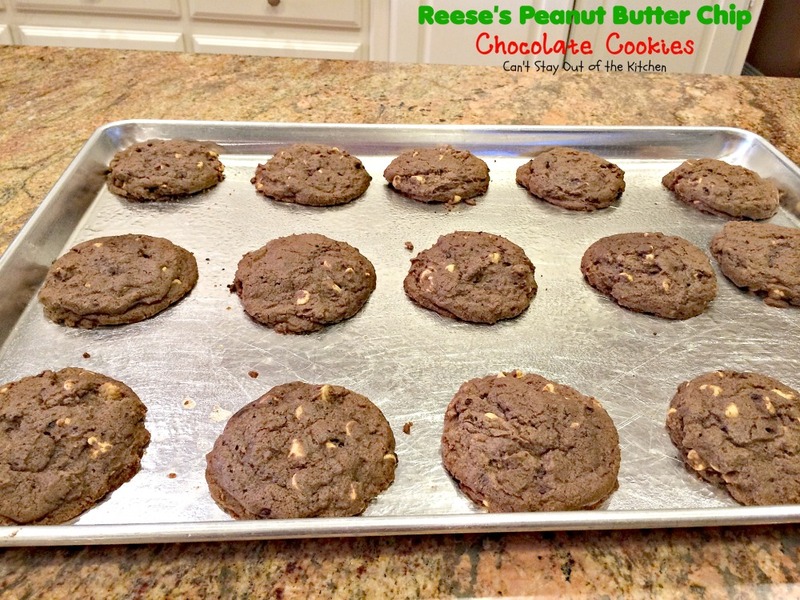 Reese’s Peanut Butter Chip Chocolate Cookies are awesome. 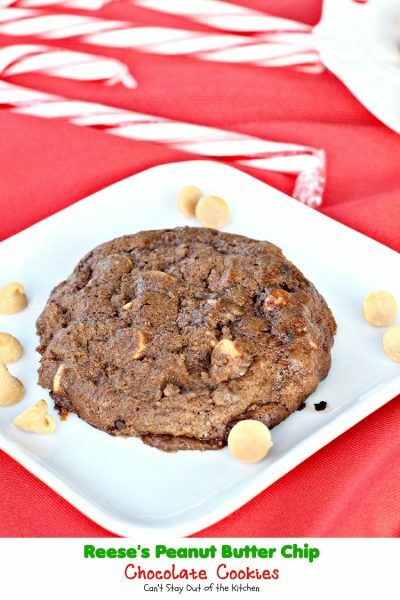 If you love chocolate and peanut butter together this cookie is the best of both worlds. 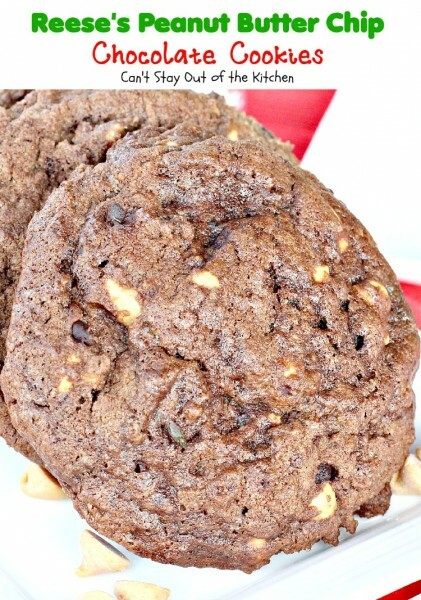 It has rich chocolate flavor, then peanut butter chips are added providing a burst of flavor that’s amazing. 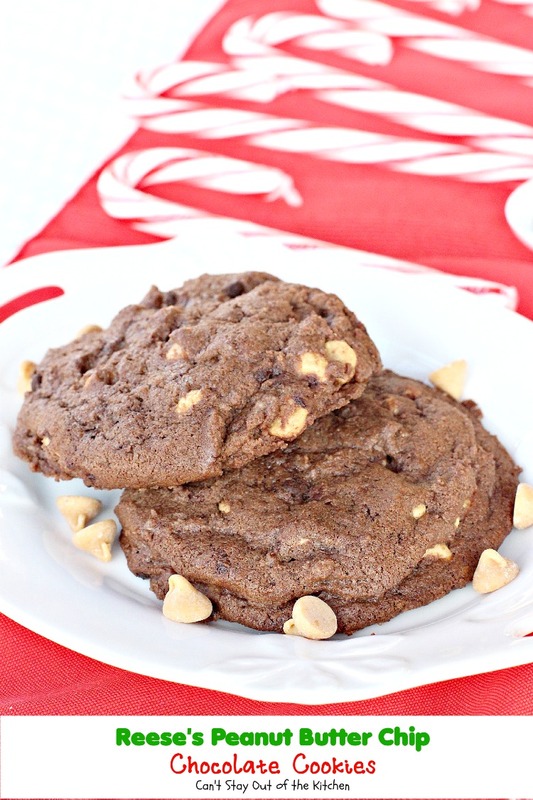 They make exceptionally good Christmas cookies, too. Almost everyone we’ve ever given these cookies to for our Christmas Cookie Extravaganza over the years has loved these cookies. The outsides are crispy but the insides are soft and chewy. This year, I made up a batch of these jewels for some long-time friends of ours who used to be directors of our Sunday school class for years. They recently took positions in San Antonio so when John was in that area for a brief visit a week ago, he surprised them with a batch of Christmas cookies before taking them out to dinner. They were overjoyed with these goodies. We’ve made Reese’s Peanut Butter Chip Chocolate Cookies for over thirty years now. We made them almost every year for Christmas in the earlier days. The only thing I would suggest when making them is not to cook them in a dark, black pan. 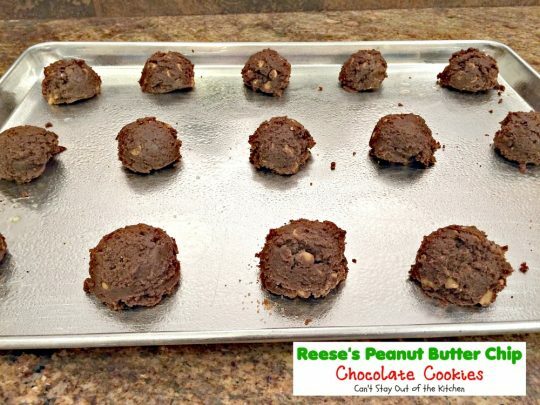 Those were the kind of cookie sheets available back in the 70s and 80s and the cookies would scorch on the bottoms even if they’d only been baking 8 minutes! The reflection never worked well. I learned to invest in better baking pans as a result. Now that I’ve been using the professional-type cookie sheets for the past 10 years or so, we’ve not had any problem. If you’re looking for a lovely chocolate cookie and you need a dose of peanut butter as well, then consider making up a batch of Reese’s Peanut Butter Chip Chocolate Cookies. 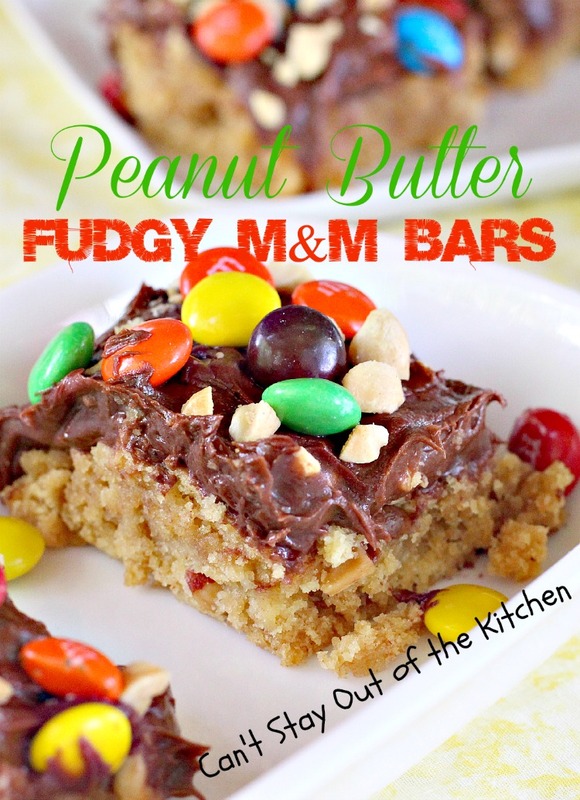 The combination of flavors is incredible and everyone always loves them. 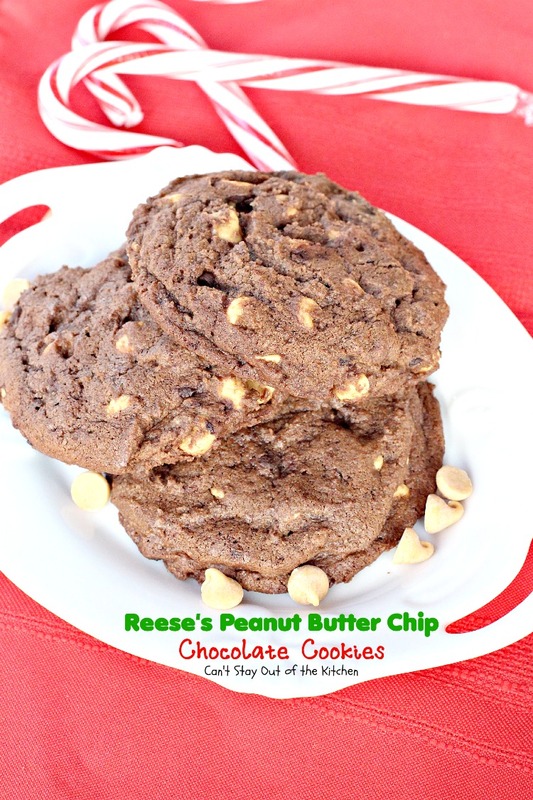 Reese’s Peanut Butter Chip Chocolate Cookies are a wonderful cookie any time of the year. These rich, chocolate cookies are filled with peanut butter chips providing awesome flavor. 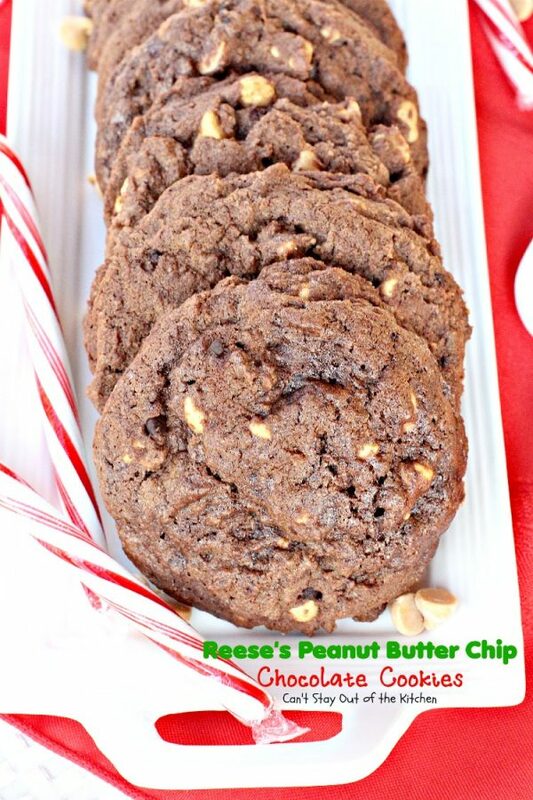 Reese’s Peanut Butter Chip Chocolate Cookies are a good choice for holiday baking. Everyone enjoys them. Place softened butter in a mixing bowl. 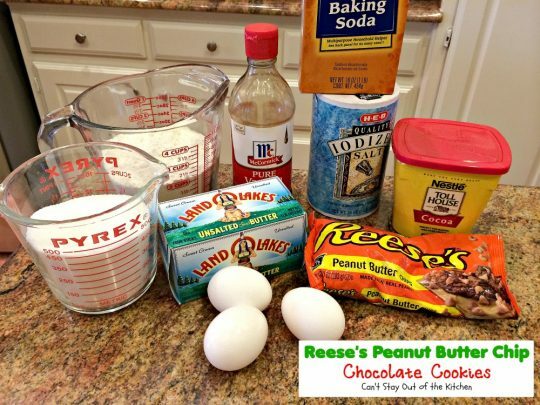 Add eggs, sugar, cocoa, salt, baking soda and vanilla. Add UNBLEACHED all-purpose flour. Bleached flour toughens baked goods. 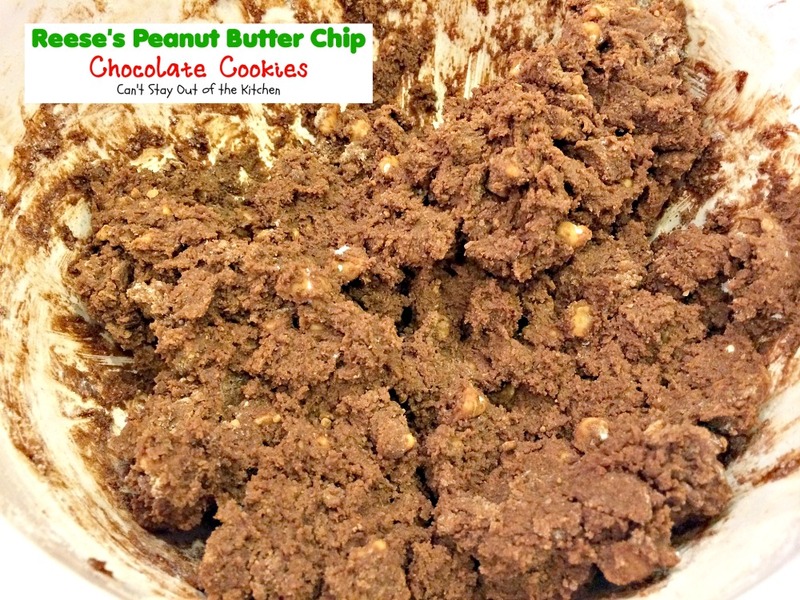 Add a bag of peanut butter chips. 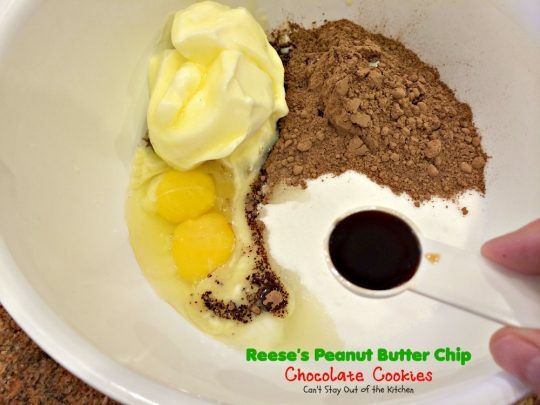 With a one-quarter cup ice cream scoop, scoop dough and place on cookie sheets that have been sprayed with cooking spray. Bake at 350 about 15-20 minutes. Mine were whoppers so they took about 25 minutes. If you bring Reese’s Peanut Butter Chip Chocolate Cookies to holiday, tailgating or Super Bowl parties they will disappear almost immediately! Reese’s Peanut Butter Chip Chocolate Cookies make great gifts to give away to friends and family. These lovely chocolate cookies are filled with peanut butter chips making one spectacular cookie. 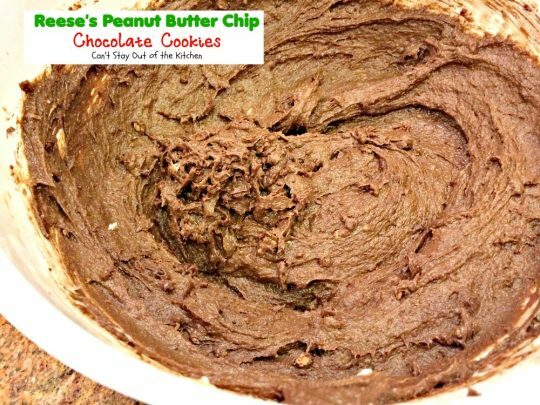 This is great to serve for any occasion, including birthdays, holidays, tailgating parties or other family events. Stir in UNBLEACHED all-purpose flour and either peanut butter chips or Reese’s mini pieces peanut butter candies. Drop by teaspoonfuls onto cookie sheets that have been sprayed with cooking spray. (Mine took 25 minutes because I had whoppers). 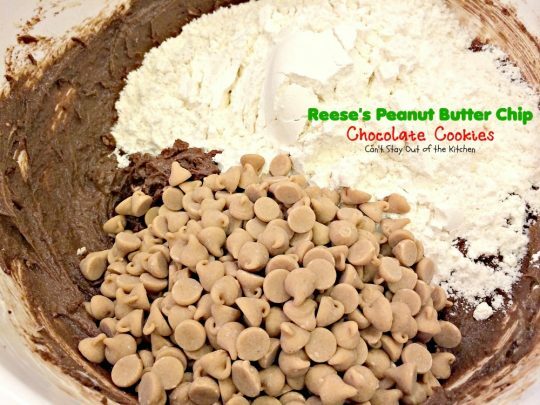 Recipe adapted from the back of a Reese's Peanut Butter Chip package, circa late 1970s. These lovely chocolate cookies are filled with [url href=”http://www.thehersheycompany.com/brands/baking-pieces/reeses-peanut-butter-chips.aspx” target=”_blank” title=”reese’s peanut butter chips”]peanut butter chips[/url] making one spectacular cookie. This is great to serve for any occasion, including birthdays, holidays, tailgating parties or other family events. 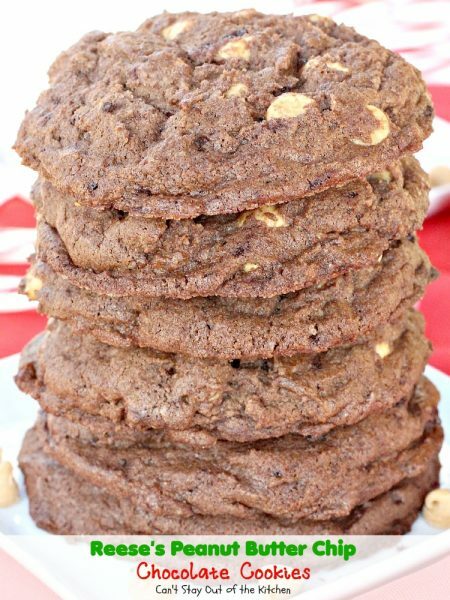 Be sure you do NOT use a dark pan to make these cookies or the reflection causes them to scorch on the bottoms, yet not be baked thoroughly. 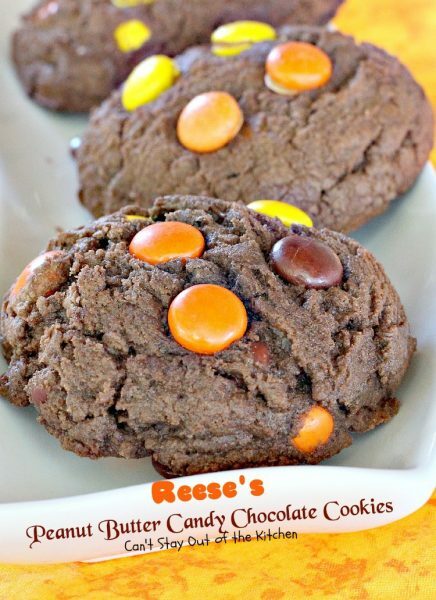 This shows the texture of Reese’s Peanut Butter Chip Chocolate Cookies. These cookies smell heavenly while baking! 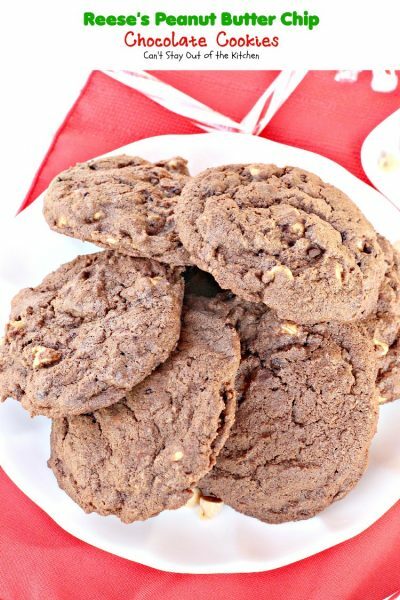 If you enjoy chocolate and peanut butter together, you will love these cookies.